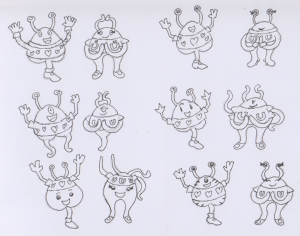 I didn’t do much sketch developments for Mrs. You, but designing her seemed fairly obvious; draw her as a big U. But after Small’s decision on the designs of them both, I went for an upside down U. 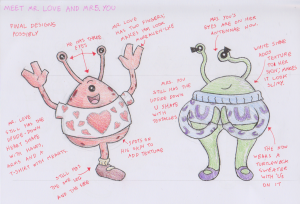 However, I also wanted Mrs. You to look radically different to Mr. Love aside from their shape. Even though they are a couple, that does not limit them to looking exactly the same to one another, which I imagine any amateur character designer would do. But that’s something I can’t tolerate for my designs; I hate making a character that looks the same as another one, unless it is intentional, like if I’m designing a twin or a body double or an evil clone or something. But in Mrs. You’s case, I definitely wanted her to look different. Especially since they’re both aliens. 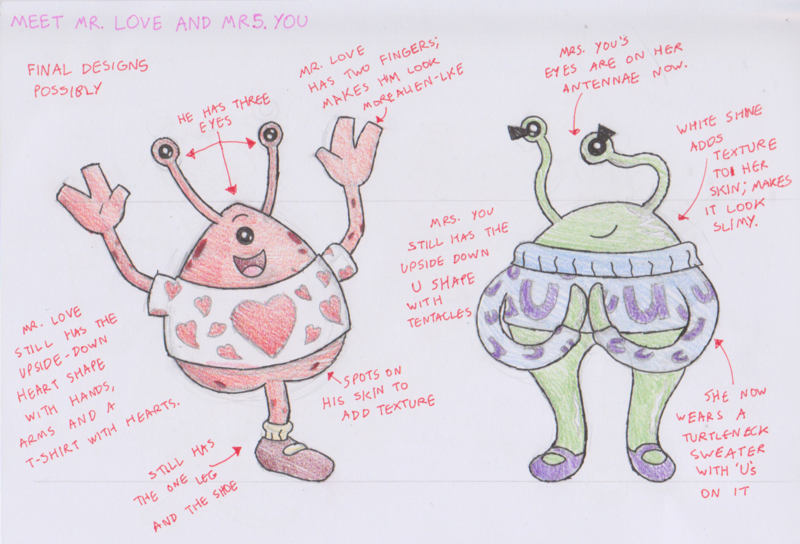 Designing two aliens that are distinctively from two different worlds, as a couple, felt charming to me. Like there’s some great big story to how these literal star-crossed lovers first met and made relations despite being from two totally different worlds. But that’s just a story I made in my head. Whether Martin Small would act on that and make an entirely new story like that is anyone’s guess. But I liked to hint at their history by adding picture frames in a scene at the end of the children’s book that can all be seen clearly in the background. I hopefully imagine any child who sees those frames would look at them and piece their own story as to how the two first met. 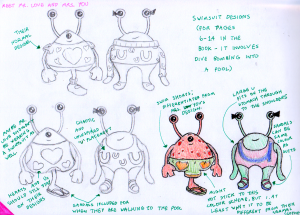 But anyway, on to Mrs. Love’s design. 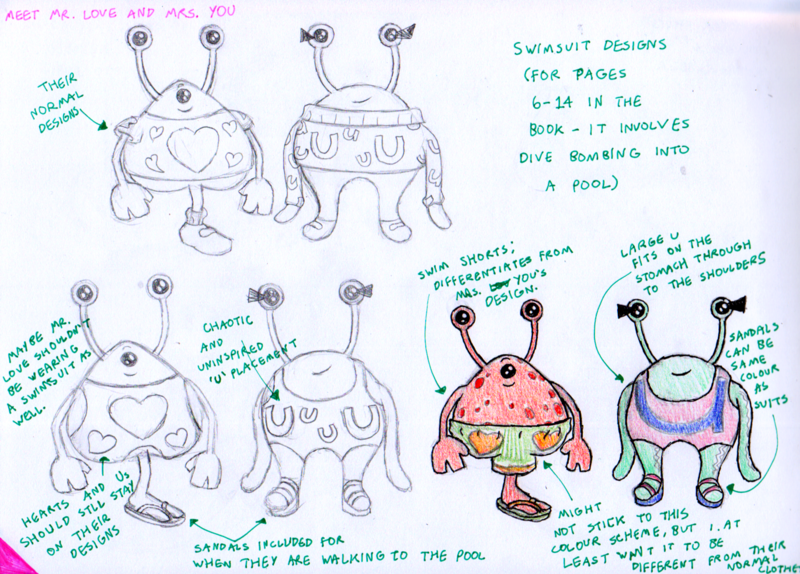 To make her a complement to Mr. You’s design, I coloured her green, which is red’s complementary colour. Giving her a green hue for some reason made me think her skin was slimy and oozy, like how some of us imagine most aliens would look like. So I made her skin look gelatinous while also giving her tentacle arms. The latter feature further complements her U design. They can both easily curve into a U shape no problem! And I gave her eye stalks as per Martin’s request. 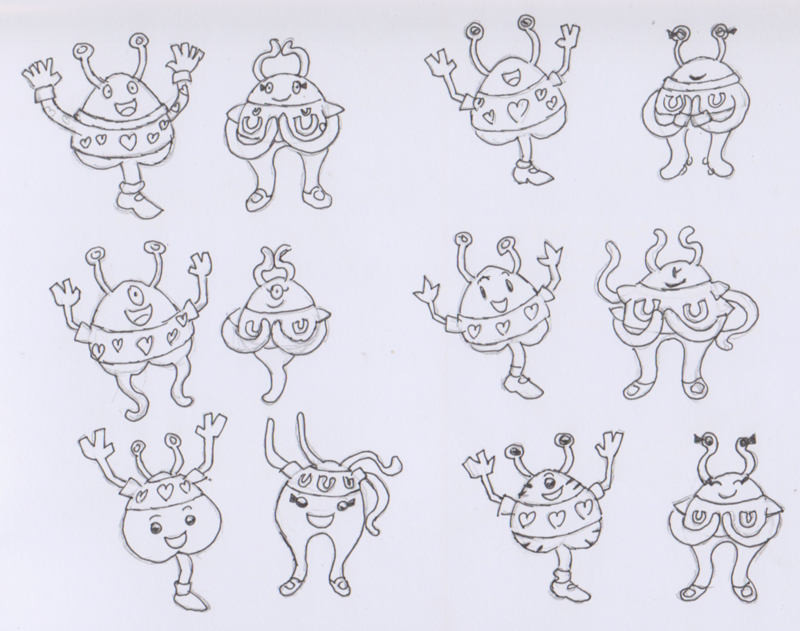 But I wanted to make her different from Mr. Love by not adding a third eye. And for good measure, instead of making her a t-shirt with lots of Us on it, it’s a turtleneck.